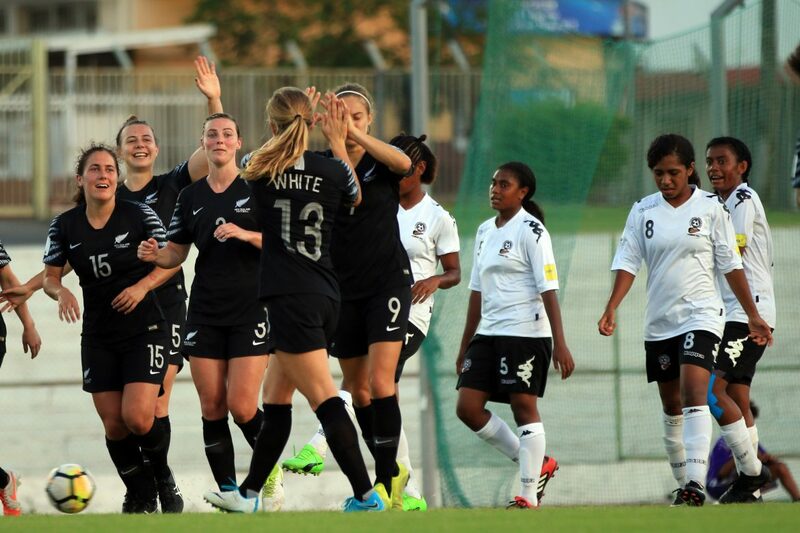 New Zealand has secured a semi-final meeting with hosts New Caledonia after a 10-0 win against Fiji saw the defending champions finish top in Group B of the OFC Women’s Nations Cup at Stade Numa Daly in Noumea, New Caledonia. The Football Ferns came into the match determined to top the group and started the match on the front foot with early dominance against a second-string Fijian side. Fiji made ten changes to their starting line-up, setting themselves up a defensive wall of two lines of four behind the ball. Annalie Longo opened the score sheet in the 8th minute followed by a brace from Sarah Gregorius before Longo struck once more to complete her brace handing the Football Ferns a 4-0 lead at the break. The second half panned out to be a carbon copy of the first half as New Zealand dominated from start to finish. Katie Rood became the third New Zealand player to score a brace in the game with two brilliant goals in the second half. Meikayla Moore and substitute Emma Rolston also got their name on the score sheet and Sarah Gregorius grabbed her hat-trick with the final goal taking New Zealand to double digits for their third straight match. New Zealand coach Tom Sermanni was pleased with another professional performance from his team. “I was happy with how we started the game and getting some early goals makes life easier for us”, he said. “I think Fiji obviously rested quite a lot of their players tonight and put in some of of their younger, less experienced players so that probably helped us a little bit as well. Sermanni highlighted a record appearance for his stand-in captain Ria Percival who has achieved a milestone 133 caps for New Zealand breaking former Ferns skipper Abby Erceg 132 international caps. “Fantastic achievement, I mean Ria is a great professional, outstanding player, a great leader and it’s fantastic to see her break the record,” the Scotsman said. Fiji coach Marika Rodu said they made nine changes to the starting line-up with the main focus already on the semi-finals. “Yes we have nine players taking the field today I think we don’t have the luxury of what New Zealand having two teams that can play at any time,” the Fijian coach said. “But with our mind focusing on the semi-final I will not take the risk of getting people injured. Despite the loss, Fiji also advanced into the semi-finals as runners-up in Group B in the process booking a semi-final with Papua New Guinea on Wednesday in Mare. Earlier in the day, Tonga ended their Nations Cup campaign with a narrow 1-0 win over Cook Islands. It was an equally contested match which saw both sides having a fair share of chances. Tonga started the match with more purpose in the early exchanges as American-based twins Laveni and Daviana Vaka who were outstanding. Daviana sent a free-kick into the box in the 3rd minute which her sister Laveni slotted home for what proved to be the match winner. Cook Islands had the numerical advantage in the second half after Daviana received her marching orders for a second yellow card offence but gallant defending from the Tongans saw them held on to claim victory. Tonga coach Christian Koaneti said he was pleased with the result after their two heavy defeats in the group. “I am just happy for the girls we lost heavily in our previous two games against Fiji and New Zealand. “And there was only one way to go we must win this one, we came along way to go back to Tonga with noting so I’m just happy it turned out in our favour,” the Tongan coach said. Koaneti added that now his team will switch focus on the Pacific Games which is just seven months away in Samoa next year. Cook Islands coach Tuka Tisam said his girls displayed another spirited performance but unfortunately the result was not on their side. “I thought they battled until the end, they really put everything on the field today unfortunately we didn’t get the goal that we wanted”, he said. “Again that’s football we just got to go us a team for the next tournament. For the semi-finals New Zealand will be taking on hosts New Caledonia in Lifou and Fiji will play Papua New Guinea on Wednesday in Mare.